We all want our nation’s schools to be safe, secure learning environments where students can realize their full potential. This requires reliable, continuous communication among school personnel, both onsite and district-wide, plus the ability to instantly connect with first responders in an emergency. This seamless communication must be delivered over any network, from any location, using any device. 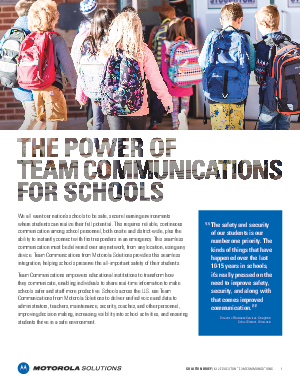 Team Communications from Motorola Solutions provides this seamless integration, helping schools preserve the all-important safety of their students. Team Communications empowers educational institutions to transform how they communicate, enabling individuals to share real-time information to make schools safer and staff more productive. Schools across the U.S. use Team Communications from Motorola Solutions to deliver unified voice and data to administrators, teachers, maintenance, security, coaches, and other personnel, improving decision making, increasing visibility into school activities, and ensuring students thrive in a safe environment.